Four years ago today, on May 4, 2012, Nigeria’s greatest striker died. 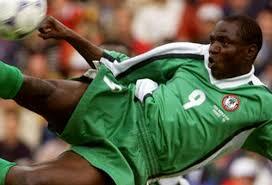 Rashidi Yekini was the epitome of class on the field. 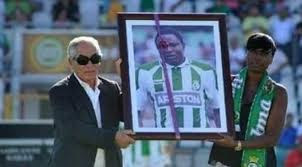 He scored 37 goals in 58 appearances for the Super Eagles and led Nigeria to victory at the 1994 Africa Cup of Nations. Yekini’s legacy also extended to the global stage where he scored Nigeria’s first ever goal at the World Cup in that 3-0 defeat of Bulgaria at USA ’94. His iconic goal celebration was listed among Top 50 most memorable goals in the World Cupof all time in 2010. Since Yekini’s last game for the Super Eagles, no Nigerian striker has reached the level of grace he achieved in the country’s colours. Many have called for one of the national stadiums to be named in his honour. It is a good call. What are we waiting for? We claim to love the game so much but find it hard to honour the legacy of our past heroes. In Brazil, the national stadium in Brasilia, the capital, is named after a former footballer, Mane Garrincha (Manuel Francisco dos Santos). For a man who gave his youth to his country and was the first Nigerian to be named African Footballer of the Year in 1993, Yekini deserves commensurate honour from his country. As a young boy growing up in the ‘90s, this writer remembers Yekini for making football easy to watch. When Yekini was on the pitch, one was sure that the Super Eagles were capable of winning matches, home and away. He thrived in both the small and big matches and always made his impact felt with opposing defenders and goalkeepers. 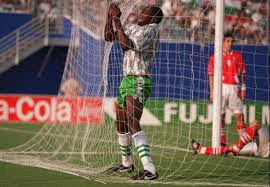 Nigeria’s run to the Afcon title in 1994 was carried on his huge shoulders as he scored in key moments to lead the Eagles to the final where Emmanuel Amuneke then scored the brace that ensured the trophy was won.